High blood pressure is a common condition that affects roughly 1 in 3 adults in the U.S. Although it’s treatable through lifestyle changes and medication, there’s still the potential for high blood pressure to lead to a more serious health problem. If you’re trying to get life insurance with this condition, it could have a direct impact on whether you get approved and the kind of premium you’ll pay. Before you attempt to purchase a policy, it’s helpful to understand how a high blood pressure diagnosis affects your application. What’s considered high blood pressure? Blood pressure refers to the force with which your blood is pumped throughout your body. High blood pressure occurs when the force is too high, which can cause damage to your heart over time. 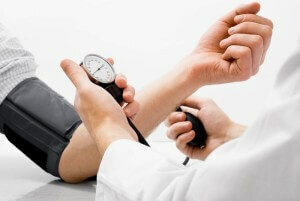 Your blood pressure is measured by a systolic and diastolic reading. The systolic number represents the pressure in your arteries when your heart beats. The diastolic number is the pressure in your arteries between heartbeats. A reading of 120/80 or below is considered normal blood pressure. Anything above 140/90 is categorized as hypertension or high blood pressure. A reading of 180/110 would mean your pressure is critically high. As part of the application process, you’ll have to answer a series of questions about your health and complete a health exam. The insurance company is going to be looking at how well you’re managing your high blood pressure. For example, they’ll consider things like your age, weight, eating habits and whether or not you smoke to determine if you’re practicing a healthy lifestyle. The insurance company is also interested in how often you visit the doctor, how long you’ve had high blood pressure and what your highest previous readings were. You’ll also be asked about any medications you take to treat your high blood pressure. For example, you might be prescribed diuretics (water pills), a beta blocker like Toprol-XL or a calcium channel blocker such as Norvasc. Other common medications used to treat high blood pressure include Vasotec, an ACE inhibitor, and Diovan, an angiotensin II receptor blocker. If you’re taking these or any other medications to treat your high blood pressure, the insurance company will want to know how frequently you take them, what dosage you’re on and how long you’ve been on them. You’ll also be asked about any other medications you’re on and whether you’ve been diagnosed with other serious health problems like heart disease, diabetes or kidney disease. Having high blood pressure does elevate your risk level in the insurance company’s eyes but you’re not necessarily excluded from getting the best rates. Again, it all depends on what your overall health is like and how well you’re controlling your condition. Each insurance company treats applicants with high blood pressure differently but there are some rough guidelines that you can use to estimate how much you’ll pay for a policy. For instance, if your blood pressure is below 140/90 but it’s above the normal range and you’re managing it without medication you’ll still likely be able to get a Preferred Plus rate. Someone whose blood pressure ranges from 140/90 to 150/90 and is taking a low dose of medication to treat it might fall into the Preferred class. If your blood pressure is in this range but you’re taking several medications or you have a family history of heart-related health problems or stroke, however, you may only qualify for the Standard rate. Substandard rates are typically reserved for applicants whose blood pressure is at the higher end of the scale and are in poor health overall. If your blood pressure is elevated significantly and you’re not following your doctor’s plan for managing it, it’s possible that you could be denied for coverage altogether. Should you choose a no exam policy instead? If you’re concerned about getting assigned to the highest risk category, you could opt to skip the health exam altogether to get coverage. These life insurance companies don’t require a blood or urine sample to qualify, although you will have to complete a detailed health questionnaire. Click here to get an instant quote for a no exam policy. When you’re considering a no exam policy, keep in mind that you may end up paying slightly more for your premiums with this type of coverage. You also may be subject to a graded waiting period, which is a safety net of sorts for the insurance company if something happens to you within the first year or two of buying the policy. See our guide on no exam life insurance. Having high blood pressure isn’t a deal-breaker when it comes to getting life insurance but it can complicate things a little if you don’t know what to expect. Taking the time to compare rates from different insurers can steer you towards the policy that’s the best fit for your needs and budget.